Back in January, I met with our president, Becky Clark, and she shared her vision for the future of OPA – a vibrant clay community with a ceramics center at the heart of it. It was inspiring to hear about a space that would provide: classes for all ages taught by local artists and artists-in-residence, rotating workshops with national artists, affordable studio space for working artists, and a gallery where we could exhibit and sell our work. She asked if I wanted to help make it a reality because this wasn’t just a dream, she had a plan! Research, plan and develop a facility. Due to my career in corporate advertising and branding, Becky asked me to tackle the first strategy and help improve our visibility. For the past 9 months, I’ve been working with a panel of OPA members (new and legacy) to develop our vision and define our identity – specifically who OPA is, what our brand looks like, how it speaks, as well as how it behaves. A special thank you to all who participated in the discussions – your input and feedback has been invaluable in developing this direction! You’ll start to notice changes over the coming months. First up is the Fall Fair - a new sales pop-up happening on Nov. 10th. It will be the first event to feature our new branding, followed by Ceramic Showcase next April. We’re also going to update our social media branding in conjunction with the fair. And last but not least, our website and printed materials will be redesigned. Please take a look and spread the word about our vision – we are here to leave our mark! Every maker leaves a mark, an impression made by the creative process, that reflects our spirit and our humanity. Our clay community also leaves a mark – not just on our work – but on each person we connect with, for the rest of their lives. Whether they are artists or art lovers, teachers or students, we welcome all generations to discover and express their creativity through clay. 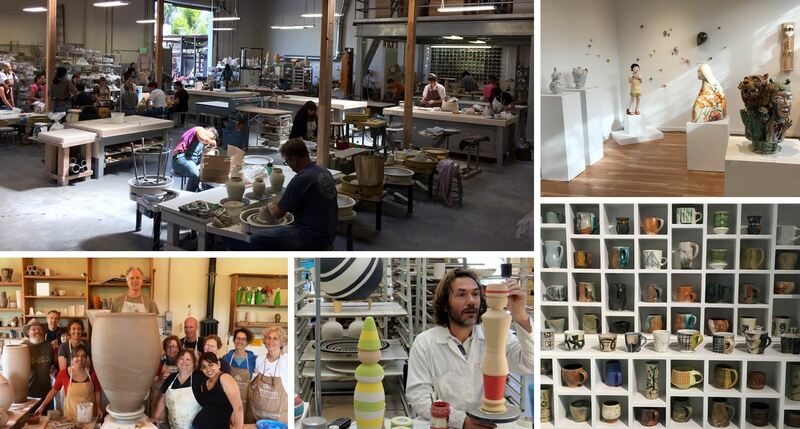 By feeding their curiosity, inspiring their artistic growth and empowering them to live creative lives, we help each person flourish throughout their ceramic journey. Our legacy is to leave a lasting impression – in our classrooms, studios, galleries, neighborhoods and the clay community at large. As a non-profit that works towards educating, inspiring, and transforming lives of our members – are we doing all that we can to fulfill our mission? Is OPA evolving with the needs of today’s ceramic artists? 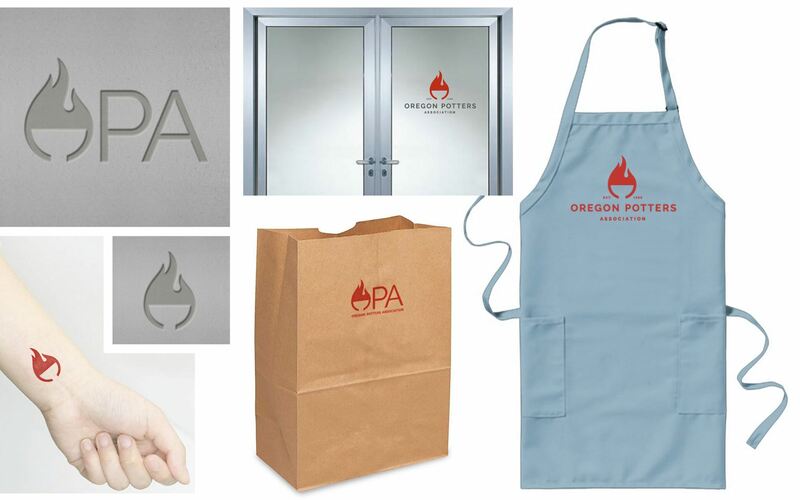 What are ceramic artists looking for when they consider joining OPA? What is the public perception of OPA, and is the perception good, bad, or even true? As we move toward the future, we are thoughtfully considering answers to these questions. We have our sights set on a clay center that will provide learning and teaching opportunities for all generations. It will promote our members’ work through exhibitions and sales, and provide affordable studio space for working artists. To accomplish this dream, we are focusing on our members and member benefits. We are addressing relevancy head on by determining the needs of today’s artists and members. We are addressing perception by narrowing our focus on demonstrating and communicating the value of our organization. Please join us on this journey and ask OPA leadership how you can help us achieve our dream! Want to decrease the discomfort that many hours in the studio can inflict on your body? It all starts with paying attention to your spine. On January 19th we met for the first meeting of 2018. President Linda Workman-Morelli passed the torch onto Becky Clark, incoming President of 2018, and we thanked the 2017 Board and Program Coordinators for a great year, and their tremendous amounts of time and effort for the benefit of OPA. An update on the Hokkaido Project. Funds are still needed to ship the children peace poles to Hokkaido. All members are encouraged to seek donations for shipping artwork. Donations can be made directly on the website. 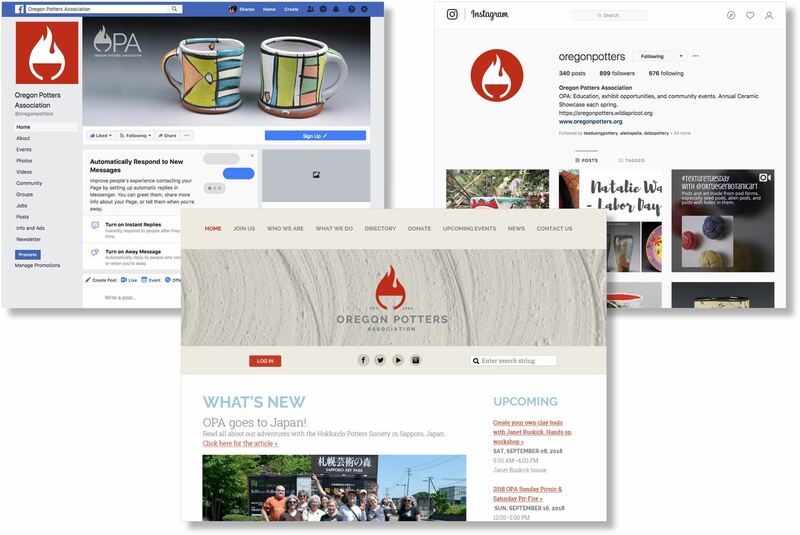 OPA members are invited to make a peace pole that will be donated at the upcoming Ceramic Showcase, profits from the poles will go towards Clay in Education and the Hokkaido peace pole projects. OPA member-created peace pole workshops are listed on the front page of the website. Some workshops are full already! There are currently still enough poles for artists to take and work on independently. The January meeting presentation was a brief introduction to Instagram, Creating an online Shopping Cart, and Photographing your artwork at home. Presented by OPA members Rafa Orderica-rea, Andy Clift, and Chris McClelland. The video can be viewed on the OPA Facebook page any time. Thank you Rafa, Andy, and Chris! The presentation was great, and more members have joined Instagram as a result! The Next Meeting is the Ceramic Showcase Booth Picking Meeting! March 9th, in the Auditorium at the Multnomah Art Center. Applications for the Portland Night Market Holiday Event are open! The Portland Night Market showcases over 175 unique businesses that call the great City of Portland home. Blending food, culture, music, drinks and retail together for an adventurous evening in the Industrial District. The event allows people to meet some of Portland's best makers, merchants and creators set in the unique venue of a 100+ year old produce warehouse. The PNM is a free event and open to all ages. The Holiday Edition of the Portland Night Market will be held December 1st - 3rd. Hours for the event are 4pm-11pm on Friday and Saturday, and Sunday from 11am-4pm. Holiday Applications are open <https://pdxnm.us12.list-manage.com/track/click?u=a71bd765dcfadb26add93c9fa&id=2a758fab2a&e=9f26a34305>. Applications are due by November 12. All completed applications will be review by a jury. ONLY approved vendors will be emailed with confirmation and event details by November 13. The full list of approved vendors will be published on our website (pdxnm.com) on November 13 at 9pm. Booth fees are due within 72 hours of acceptance email and must be paid via paypal. Checks will not be accepted. After the 72 hour period unpaid booths will be offered to waitlisted vendors. It's Empty Bowls at the Waterfront Blues Festival time again! Time to help feed the hungry, because no one should be hungry. OPA partners with the Oregon Food Bank and Georgies for this event. The Food Bank sets up the big tent, June 30 - July 4, Georgies hosts a Throw-a-thon, and stores the donations, we donate our work, make pots at the Throw-a-thon, and sell them at the Blues Festival. 100% of the money raised from donations goes to the Food Bank. Gretchen Lambert and Robin McDonald are the chairs this year and we are now signing up volunteers and sellers. Sellers keep 75% of their sales (the rest goes to the Food Bank), get 2 four-foot shelves the last 3 days of the event, agree to work three shifts plus either set up or breakdown, donate approximately $100 of work, and know they are doing a truly positive thing for their community. The Throw-a-thon at Georgies is scheduled for June 16 - 30 this year. Contact Robin McDonald, levasseurr@comcast.net, to volunteer. Contact Gretchen Lambert, gretchen.lambert@gmail.com, to donate work. Members newsletter including articles on this page and a lot more published 6 times a year. 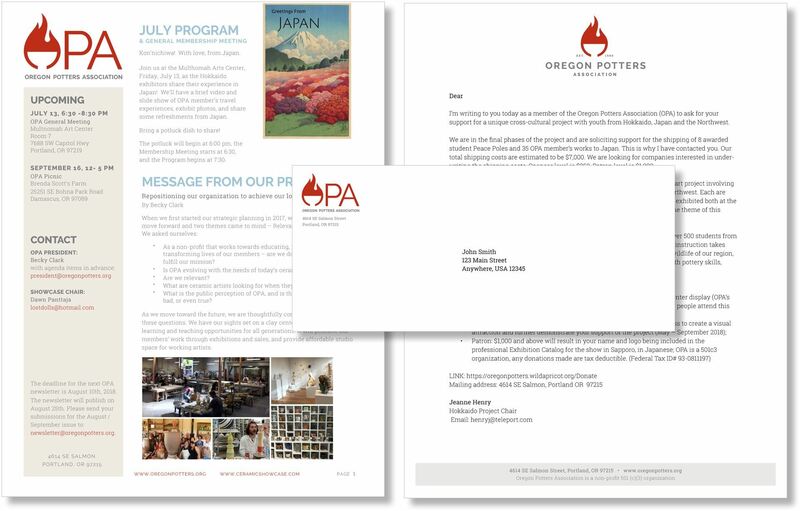 The deadline for the next OPA newsletter is February 10th, 2019. OPA Program Coordinators & Board Members with Admin Access please submit your Article here by clicking on the Add Post Button.